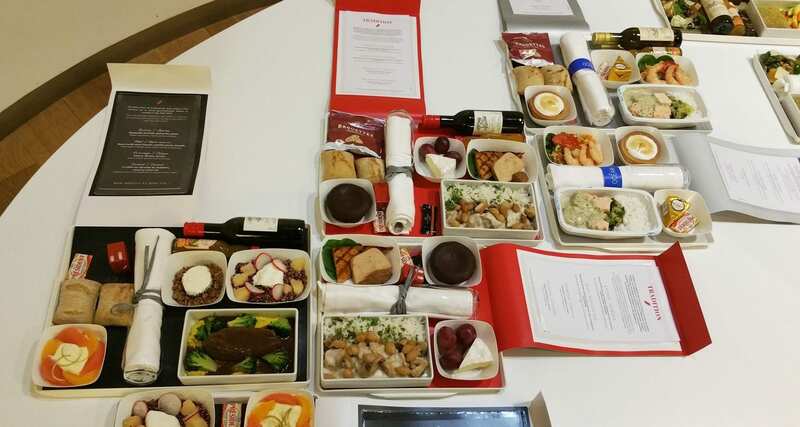 There really is something special about these airline meals that you can pre-order on select flights when flying Air France. A few months ago Air France hosted a few friends and me at their flagship lounge at Paris CDG airport; they gave us access to a closed quite space where we interviewed their chefs from Servair and got to take a closer look at these meals. We filmed the entire day with Air France for the upcoming Inflight Food Trip documentary. Last year when flying to Bali I flew from Paris to Singapore with Air France and pre-ordered the Lénotre dish which you can read about right here. 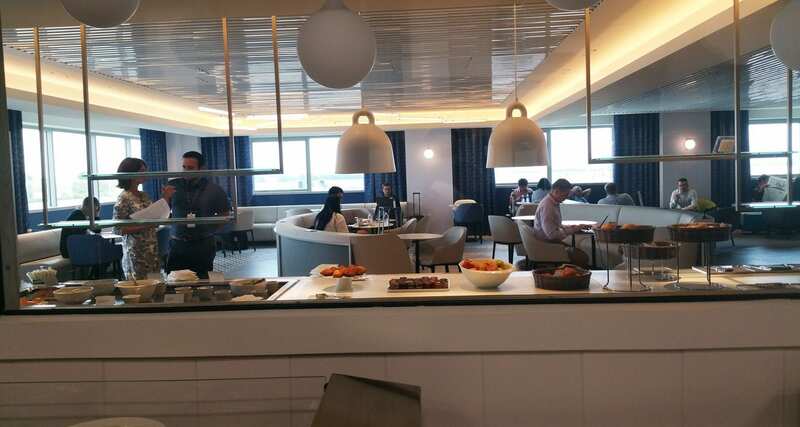 But before we take a look at these meals a quick peek at their recently renovated lounge at Terminal 2G. The reason why I decided to include this is that they have a bakery in this lounge that makes everything fresh! Very nice touch. Flights from this Terminal are generally operated by aircraft of up to 100 seats, and frequent flyers had provided feedback to Air France that the previous lounge at Terminal 2G wasn’t up to scratch. The airline listened, renovated the lounge and re-opened it on 1 March 2017. 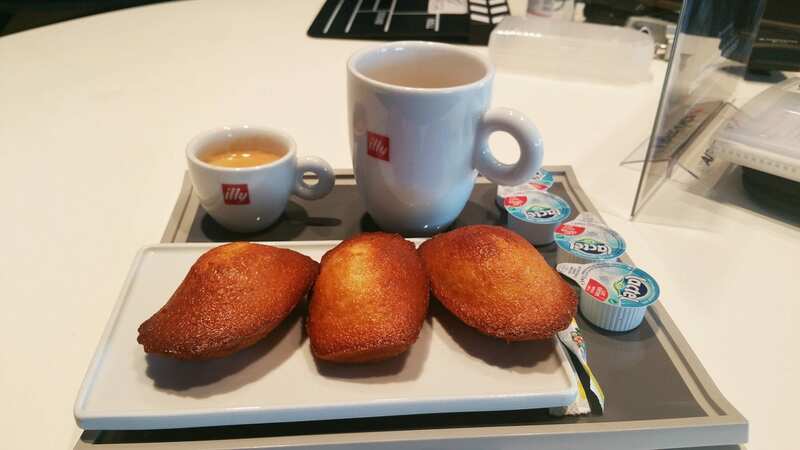 There’s a collaboration with Illy to provide great coffee and the food offered is Parisian style with choices of hot and cold offerings that are prepared fresh in the kitchen. 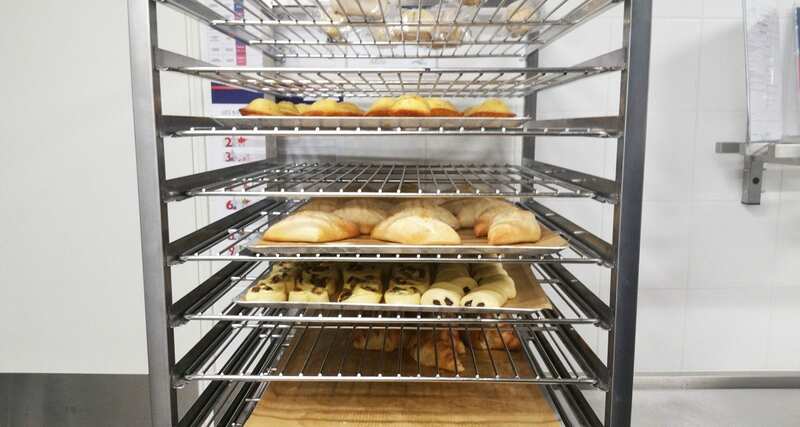 But the best part is that bakery! Now onto those amazing pre-order meals. 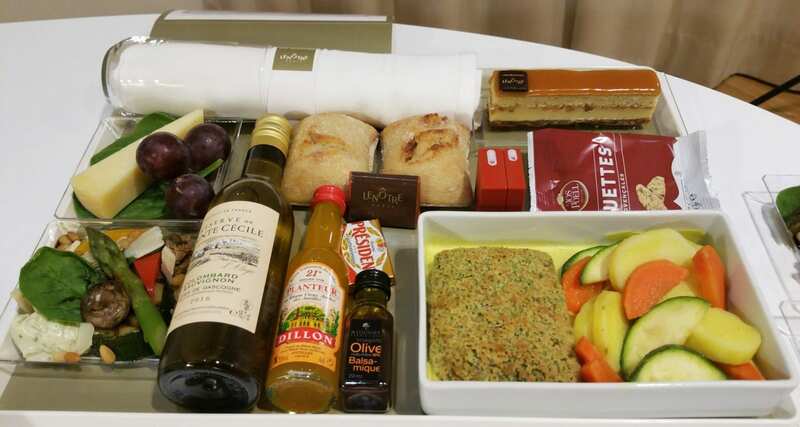 If you’re flying with Air France from Paris to most long-haul destinations (check here for the latest info), you can pre-order and pay to upgrade your free economy/premium economy class meal to something a little more special. I’m a big fan of these types of meals, and the Air France offer certainly doesn’t disappoint. Here is a rundown of the current meal offerings which are subject to change! All of these meals are of high quality, taste great and have been very well thought out. If you have the chance to order one I don’t think you will be disappointed. This is a business class style of meal, and in my opinion worth every cent! An appetiser consists of an assortment of antipasti, main is a Herb-crusted hake in a lemongrass sauce with mixed vegetables, followed by Cantal cheese, grapes and spinach and no meal is complete without a delicious dessert which is a Lemon and hazelnut dessert created by the team at Lenôtre. Isn’t it beautiful? Now in case you’re wondering who Jean Imbert is, he won Season 3 of Top Chef in France back in 2012. Air France decided to collaborate with him, and since March 2016 he has been creating his pre order meal for Air France passengers. The meal includes a starter of Bufala mozzarella, organic quinoa, and pears, for the main a Confit beef in teriyaki sauce, yellow carrots, broccoli alongside Goat’s cheese, apricot, buckwheat and a Josephine citrus shortbread biscuit with organic lemon cream. An authentic French-inspired meal using the very best of local French products. For an appetiser you will have a Foie gras terrine, gingerbread, dried fig chutney and baby spinach, the main meal is a veal blanquette, thyme-glazed pearl onions, mushrooms and basmati rice, followed by Camembert and grape bunch and finished with Granny’s chocolate cake! May I just add that the chocolate cake was the highlight of this dish for me. Wow. An ocean inspired meal that consists of an appetiser of Shrimp sautéed in ginger, raw char and baby spinach salad followed by a main of Salmon in sorrel sauce, basmati rice, baby vegetables (leeks, tomatoes, onions) with some Camembert cheese and a Lemon meringue shortbread biscuit for dessert. There is also an Italian option, but this meal is limited to select flights only, and it costs only €12.00, for further information on the meals head here. 1- When purchasing your flight online at airfrance.com. 2- After booking your ticket in the ‘your reservations’ section on the Air France website from 90 days and up to 24 hours before departure. 3- At online check-in from 30 hours and up to 24 hours before the flight.